It will happen on Family Guy, not The Simpsons. Entertainment Weekly said about the plot “Peter and the rest of the Griffins embark on a road trip and wind up in Springfield. There, they cross paths with Homer, who graciously greets his new ‘albino’ visitors, and the two families become fast friends. Stewie is impressed with Bart and his assortment of pranks, Lisa tries to figure out exactly what it is that she’s good at, and Marge and Lois do some bonding. 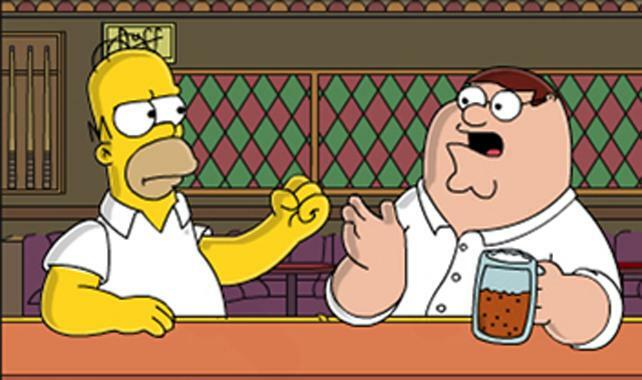 Meanwhile, Peter and Homer argue over which beer is better: Pawtucket or Duff.” The episode won’t air until 2014, leaving FOX executives plenty of time to figure out an excuse to get the Cleveland family and the Smiths from American Dad! on the episode and still have enough time left over to decide doing so would actually be a good idea. Entertainment Tonight went on to say “…they’re kids are also getting along nicely, with Stewie hearing all about Bart’s pranks through the years.” No word yet on whether ET knows the difference between there, their, and they’re. Overall, this is disappointing news to real fans of the shows. What was once a heart-felt rivalry between two great comedy writing teams and two sets of animators has become a Hannah Barbara fanfare for people who no longer have any new ideas. Maybe we’ll get lucky and the episode will be hilarious; more likely than not, we’re placing money on it being a mediocre cash in crossover episode. You know… like FOX’s whole animated lineup. Both shows jumped the shark many years ago.